To say Etta James was one of the most prolific jazz, soul and blues singers on the planet is a fact, to say her voice will never be matched by another is a fact, to say Etta James:Live At Montreux is the best compilation and showcase of her work is also a fact. It's a great album and has been on repeat in my car for weeks, even the omission of some of my faves couldn't put a damper on the sheer joy this album produces. Live At Montreux is a different sort of live album as it's Ms. James' performances at the Montreux Jazz Festival spanning from 1975-1993. 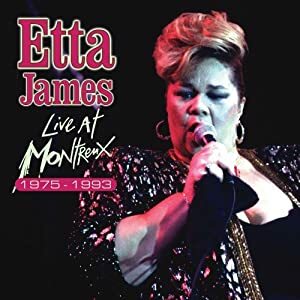 Over Ms. James' long and storied career, she made many appearances at the Montreux, and for the first time ever, Eagle Rock Entertainment has put together eleven of her best performances for this CD and will include these and a few others in the DVD coming out on August 28. Etta's infamous cover of the Muddy Water's tune “I Just Wanna Make Love To You” starts us off and sets the mood for what we're in for with this upbeat, classic tune showing Etta to be fierce and in charge on this 1993 recording. The next five songs are from this same show and her energy is incomparable and contagious. We get to hear her bantering with the crowd and their reaction to her and obvious love for this woman. Speaking of W.O.M.A.N.- this raunchy and naughty classic clocks in at over ten minutes and is the most authentic of what I imagine an Etta James show to have been like. I really can't wait to see this on the DVD. She growls, groans, moans, improvises and the crowd is putty at her feet by the end. The big treat here is what she calls her medley, comprised of “At Last”/”Trust In Me”/”A Sunday Kind Of Love” and while I'd have loved full versions of any one of these, she knows what she's doing and weaves these together seamlessly and it's nothing short of amazing. She starts it off by saying “I wanted to do ballads to show y'all I can do something different.” As if anyone had any doubt Ms. James. After being leveled by this trio we are further annihilated by “Sugar On The Floor” which can and does reduce me to a sobbing, slobbering idiot even when I have nothing to slobber and sob over. This is the ultimate “I want to love you and let you love me but I'm afraid” song and it's pretty damn perfect. Losing the glorious Etta James at the opening of this year was a hard blow for music and fans of it, but this compilation gives us a sweet taste of Miss Peaches at her best to cherish forever. Do yourself and your music collection a huge favor and grab Etta James: Live At Montreux while you're pre-ordering the accompanying DVD or Blu-Ray.